I was talking to Niece, like I do pretty much every night, and she helped me with this quick dinner idea. I love Chow, burritos and pizza as much as the next gal, but really. I have to tell you, the photo does not do the tastebuds justice! So refreshing was my dinner with bowtie pasta, two tablespoons of ricotta, lemon zest, and edamame. Thanks, Niece! I went to Rosamunde last weekend and had a vegan dog. They make it right, with grilled onions, hot peppers, sauerkraut, and spicy mustard. I should say that this establishment is not known for vegan dogs, but sausages. The real kind. I looked over to my neighbors and saw they each had a steaming bun with t-w-o links inside! I liked this look, envied it even, so I decided to make my own. Feast yer eyes on this! 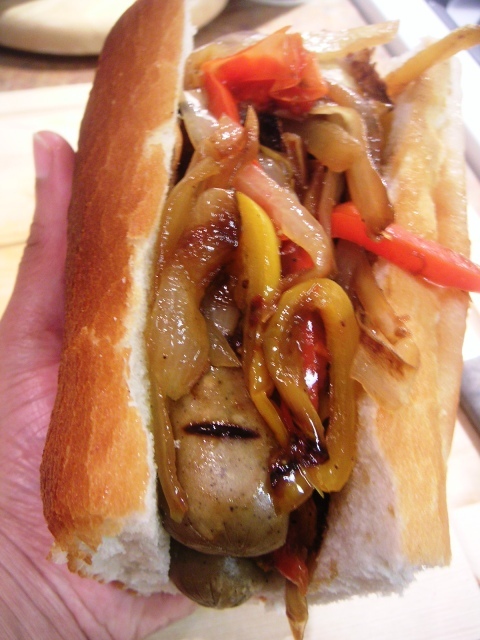 Tofurky Beer Brats have incredible flavor, and grill well. I actually made this for future consumption, took a photo, and disassembled it so that I can have it tomorrow night. Tonight @ 8pm: fried rice, featuring the last kumquat! This one is an old favorite! First I scrambled an egg in a little olive oil, and added about 3-4 cups steamed rice. Then frozen veggies from GNF. Finished this dish off with soy sauce, a couple dashes of sesame oil and, MmmM! Since I used sesame oil, I added shredded seasoned seaweed for more yumminess. Gonna be great leftovers! !